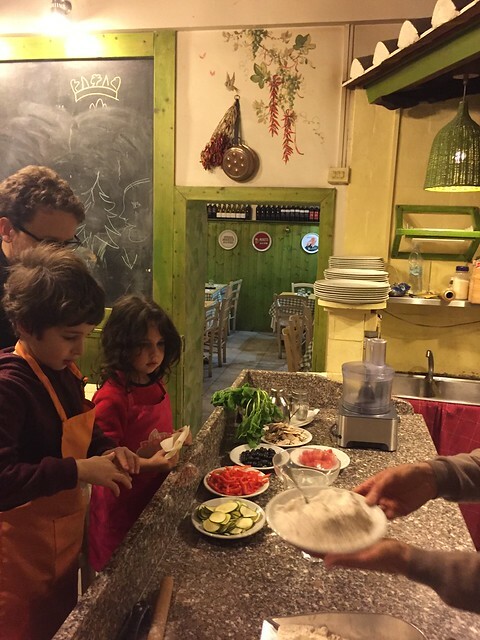 Looking for a family friendly pizza class in Rome you can take with your kids? 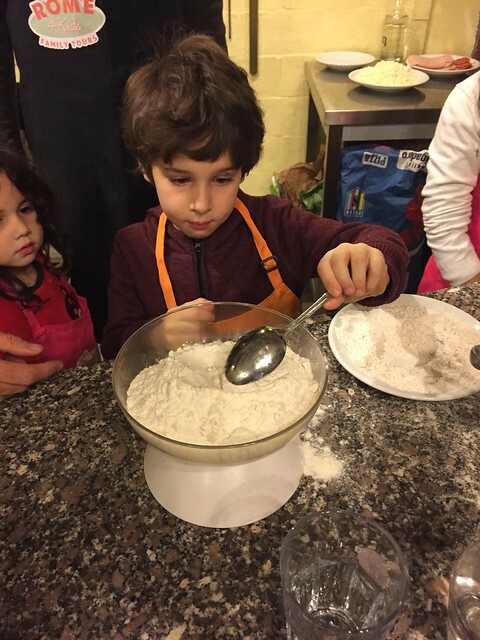 Don’t miss our full review of the Rome4kids pizza class, one of the highlights of our time in Rome. 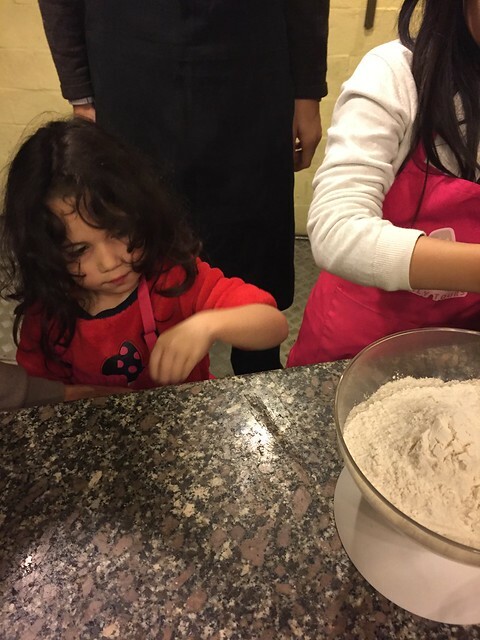 Pizza is one of the many reasons our children love to go to Italy, so when I discovered you could take a kids pizza making class in Rome I knew it would be the perfect family activity. The class takes place in a real pizzeria, with a real wood fire. 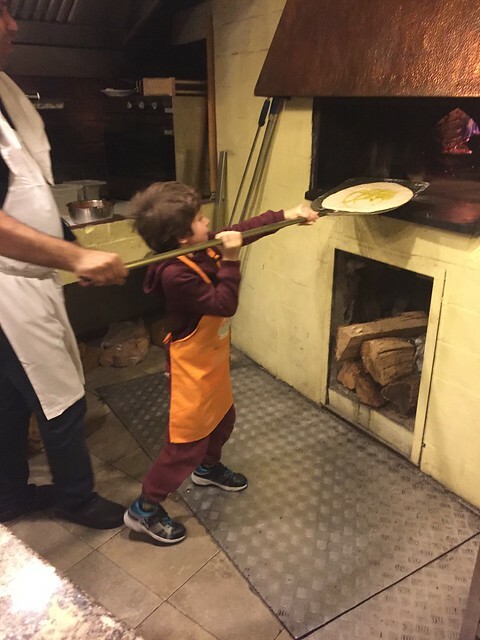 We make pizza at home often so, for me, to have the kids experiencing the real thing was important (the wooden fire is totally safe, more details below). I also loved the idea of finishing the class with a relaxed meal in a real local joint. My choice proved correct and we had a fantastic day: the pizza making class was fun for all of us, it made for a delicious lunch and stayed as one of the highlights of our trip to Rome. We booked our pizza making class for a late morning in December. 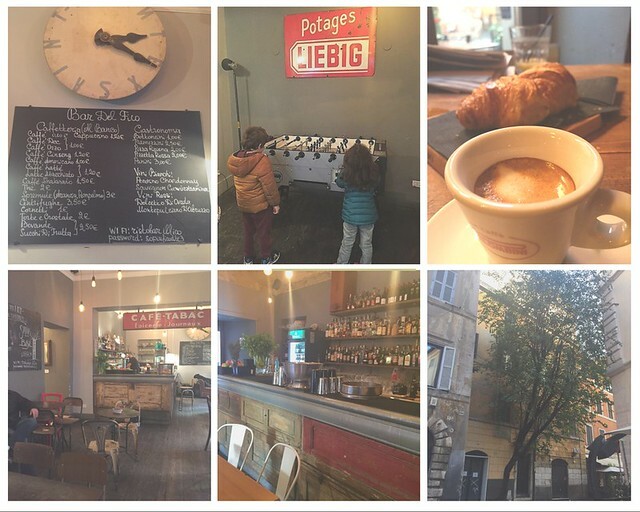 The lesson takes place in a real Rome pizzeria near Piazza Navona, one of Rome main squares, and we thought going during daylight would mean we could combine the activity with a nice walk. We were really lucky with the weather that day and we quickly realised we had made the right call: we got to the pizzeria by bus (there are many serving that area) and we got there early enough to take a stroll. In this area, Rome is full of the cobbled streets that make it famous around the world and we were able to stop for coffee and cornetto in one of its loveliest corners: piazza del fico. Going for coffee with two kids is never the relaxing experience we were uses to pre-kids, but in this case we stumbled into a bit of a find: on piazza del fico there is a cafe called bar del fico (‘fico’ means fig tree) and inside it is has a Fussball table and a wooden driving range game. The people who designed te place went for Seventies, vintage style and the games are part of this retro, artsy approach, rather than a family friendly vibe, but a ball is a ball and our kids were suitably entertained! We perched ourselves at one of the tables and were able to enjoy a strong Italian coffee while their laughter in the background: it was a good start of the day. When the time to join the class came, we walked back to the pizzeria and were welcomed by chef Maurizio. He was very friendly to us and the kids and quickly gave us a table, treated us to drinks and introduced us to the other family we were sharing the class with: they were from Japan and had two kids of similar age than ours – it was lovely to see such an international group. Food really makes people bond. Kids and adults received aprons and we quickly gathered around the pizza-making bench. We were shown the ingredients and each kid was given a task: depending on age, they poured, mixed, added pinches of salt and choose their very own pizza toppings. 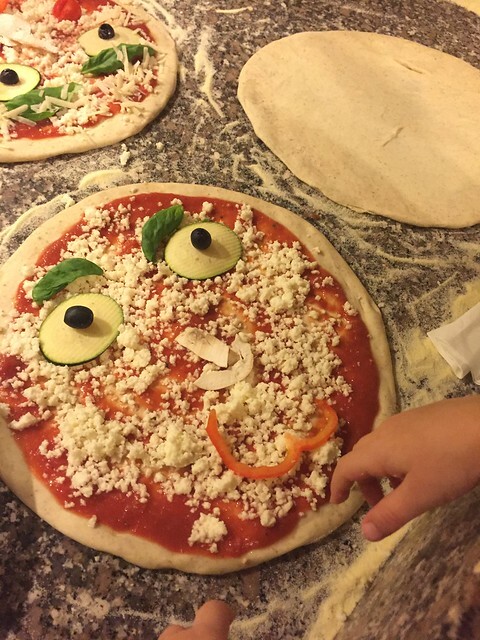 Chef Maurizio showed them how to decorate their pizza to make a face and this meant they all added courgettes and olives to their creation – yes, the pizza making class turned into a vegetable eating success, what more could we ask for? We made one pizza each and the chef gave us nice tips on how to make the perfect one. Without revealing too much, I can tell you that the big trick is to only have a thin layer of ingredients on top: this way, the pizza cooks evenly, while if you have a heavy lump of toppings, it end up being burnt on the sides and soggy in the centre. After mixing and prepping, the pizzas were ready to go in the oven. Real Italian pizza is made in wood fire ovens and we had one burning behind us the whole time. The oven is safe for kids (there is no way they can reach the flame or get too close to the hot parts of it) and they were allowed to get the pizza in with the long ‘spade’ specific for this purpose. They absolutely loved being able to do this and let me tell you: it is not an easy task! We also tried to get the pizza on the spade and it took us quite a few attempts (and quite a few creases on our pizza) before we succeeded! They absolutely loved being able to do this and let me tell you: it is not an easy task! We also tried to get the pizza on the spade and it took us quite a few attempts (and quite a few creases on our pizza) before we succeeded. In a hot wooden fire, pizza cooks in few minutes so after our efforts we could sit down at the table and enjoy the fruits of our labour. The pizza was really nice and since we had one each, we were even able to bring some back home to have as a snack later on. The class was a success and we need to thank Rome4 kids tours and the lovely people on Il braciere, who made our kids feel welcome, empowered and truly entertained. I highly recommend this activity to all families! If you want to get your kids ready for this activity, make sure you get some of the cool books set in Italy for children: some are about pizza too! While nothing compares with the experience of making real pizza in Italy, it is possible to make delicious pizza at home, with homemade dough and fresh ingredients of your choice. This is an easy pizza recipe for homemade pizza dough I use often, now tweaked with some of the tricks we learned during our pizza class in Rome. I have added a pinch of sugar as I find the crust doesn’t come out as crispy without, if cooked in a home oven, but the original recipe doesn’t call for it. In a big bowl, mix the flour, the yeast and the sugar, then add the salt, the oil and, slowly, the water. Start mixing everything with a wooden spoon and, as soon as the dough starts coming together, pour it onto a clean cooking surface and knead with your hands. Push down on it with the palm of your hand and fold it onto itself a few times so that it incorporates air. Pizza making is not an exact science so it may happen that you find yourself in need for a little more or less water than what the recipe states. However, there is a good rule when your home-made pizza dough is ready: it must not be sticky. While at the strat you will find it hard to remove from your hands, you will soon see it changing its texture and you will be able to handle it keeping your hands clean. If you prefer to avoid the sticky, messy part, you can have an electric mixer doing the first bit of the work. Once the dough is ready, let is rest for at least a couple of ours in a warm, dry place (again, this may vary depending on the type of yeast used, it may take up to 24h). The dough will rise significantly: when it is about double its size, it is ready to be flattened. The best way to flatten pizza dough is by hand: take a small amount of it (about the size of a tennis ball or less) and work ith with your fingers to shape it into a round base – it should be thin but not paper thin or it will break. While you work, but on the oven and warm it up to 220 degrees. Put the ingredients of your choice on your pizza (I love simple ones: passata, good quality mozzarella and basil) and cook – your kitchen will be filled with the smell of pizza in no time!